Rosehill Wine Cellar offers wine inventory software and wine cellar management systems to wine cellar managers amd wine lovers keen to drink wines at their peak. Easy to use software system installed in wine cellar help manage wine inventories to - collection? Check out eSommelier. We offer a variety of management designed specifically for wine. The software systems are designed to keep track of your wine purchases, cellaring, tasting notes and consumption. Whether you have 10 bottles or 10,000, you can easily keep track of your collection including such information as drink by dates, tasting notes and food matches. 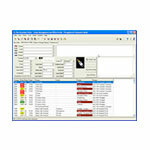 Cellar Management, eSommelier and the wine label software are available for shipping throughout the USA and Canada. Cellar Management system to be located inside your cellar. The easiest solution around; simply scan bottle to remove from cellar. eSommelier offers a comprehensive service of cellar management including inventory, cataloging, labeling, organizing, maturity and ratings which are internet accessed. eSommelier allows user to access collection via a simple to use touch screen interface, collectors can search their entire wine cellar from anywhere in their home or abroad. If you are an avid collector of wine, it is in your best interest to protect your investment by managing your collection and drinking your wines when they’re at their finest. At Rosehill Wine Cellars, we offer a variety of wine management solutions so that you can always be up to date with your ever growing collection. Whether an eSommelier cellar management system, installable wine label software, or printable wine bottle neck tags, we have many options that can allow you to manage your wines in a way that would suit you best. No matter the notes you wish to record, Rosehill’s Cellar management products are the perfect products that will help keep you organized.